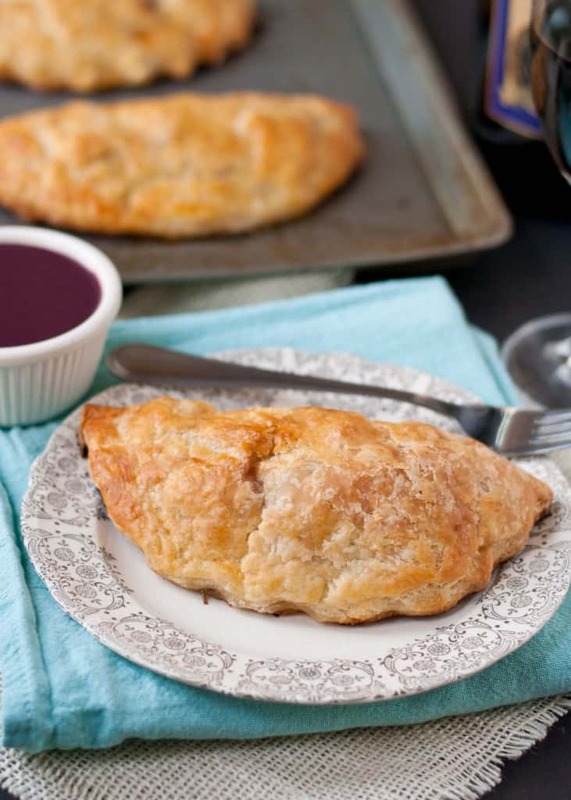 These Cornish Beef Pasties are filled with rosemary burgundy steak, wrapped in flaky pie crust, then dunked in rich burgundy gravy. Never heard of a pasty before? You’re not the only one. I didn’t even know they existed until I met my husband. When I first learned about the pasty I had little interest in ever trying it. The word itself freaked me out. I thought it was pronounced paste-y, and it conjured up images of sticky Elmer’s glue concoctions, or, worse, stickers used to cover up a woman’s hoo-has. Neither of these were things I wanted to eat (or make). 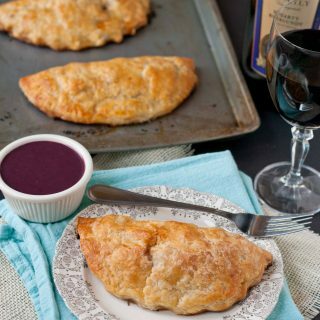 But pasties (pronounced past-ease) are actually more like portable meat pies popular in the Upper Peninsula and across Northern Michigan. In those areas, you can find pasties prepackaged at gas stations for travelers. My husband spent several summer traveling Northern Michigan in college, and he grew to love this road ready food. History has it these meat pies traveled to the United States with Cornish immigrants who were miners by trade. These clever folks discovered the pasty was the perfect lunch for a hardworking miner. It was entirely sealed and it could stay warm for hours in the mine. Plus it was hearty, satisfying, and could be eaten without any utensils. How’s that for the ultimate lunch box? As it turns out, these meat pies with the unfortunate name are actually quite delicious. Ironically, I had to travel all the way to Phoenix to finally try one, but once I did, I was hooked. The beef filling was rich and fall-apart tender. The crust? 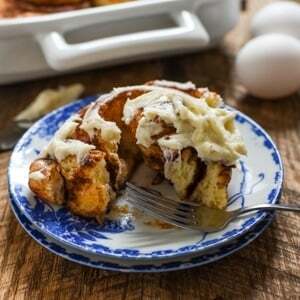 Flaky and buttery. It was like eating a beef stew pot pie without the bowl. This particular pasty restaurant served their pasties with a side of red wine gravy, and it’s the taste of that gravy that sticks with me today-over three years later. That first beef pasty has long been on my list of things to recreate, but for some reason I’ve put it off. 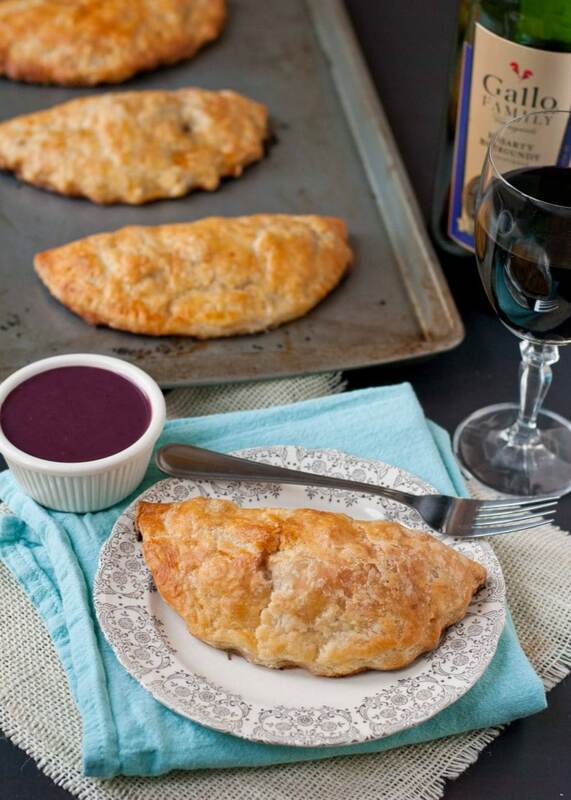 When I found out I’d be receiving a bottle of Gallo burgundy wine, I knew it was destined for these pasties. 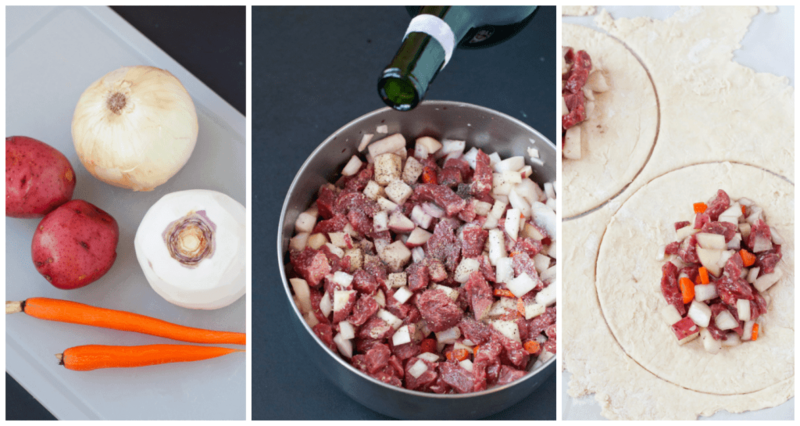 These savory meat pies are easier to make than they look, especially if you use pre-made pie crust. All that’s required is a quick chop and toss of the filling ingredients (tip: don’t leave out the turnip–it’s what makes a pasty a pasty!). Then, using store bought pie crusts or your own favorite recipe, cut 6-8 inch rounds (I used a pot lid for this) of pie crust, spoon in the filling, fold in half, and seal the edges with a fork. 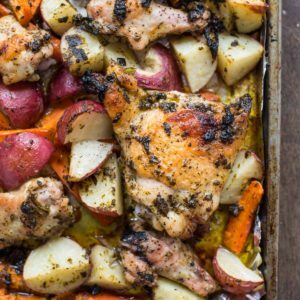 You can leave the rest of the work to your oven. And about that gravy. Ya know, the gravy that’s haunted my dreams for 3 years? It’s made with Gallo Family Vineyards Burgundy Wine and it.is.amazing. You may just want to skip the pasty and drink this. Kidding. Sort of. Gallo named this particular wine “Hearty Burgundy,” and I can’t think of a better description of the depth and elegance this wine brings to an otherwise standard meat and potatoes meal. What once was a miner’s lunch is now something classy enough to serve at a dinner party. You can eat it with a fork if you want to be fancy, but the best way to eat these are just like the miners did: straight from your hand, holding it up and down so all those glorious beef burgundy juices stay in their puff pastry pocket. By the way, double-dunking is totally acceptable. Perfect in your favorite stew, gravy, or wine glass, you can find out more about Gallo’s Hearty Burgundy by clicking here. Want to know how to get your hands on a bottle? Visit their store locator. You can also find out more about this family-owned winery by finding them on Facebook, Twitter, Instagram, or YouTube. I think it’s about time we let Michigan’s secret out of the bag. The Cornish Beef Pasty is just too good not to share. Chop the steak, potato, yellow onion, turnip, and carrots into small uniform cubes. Toss them all into a large bowl, sprinkle with salt, pepper, rosemary, and garlic and toss to combine. Pour the wine over all and toss a final time to mix. Set aside. Roll your pie crust out between two pieces of parchment paper into a rectangle that's about 1/8-1/4 inch thick. Remove the top layer of parchment paper. Use a 7-8 inch round pot lid to cut circles out of the rectangle. Spoon about 1/2 cup of the steak filling in the center of each circle. Fold the circle in half and pinch together the edge to seal. Flute the edges or crimp with a fork. Gather any scraps of pie crust up into a ball then reroll and repeat until there's no pie crust left. You should be able to get 6-8 circles out of 2 pie crusts depending on the size of your pot lid. Carefully place pasties on a parchment lined baking sheet. Whisk together water and egg and brush mixture evenly over the pie crust. If the seal doesn't seem secure, use the egg wash to pinch any loose parts closed. (Note: at this point, you can slide the tray into the freezer, freeze the pasties until firm, then remove from the tray, wrap in plastic wrap, place in a freezer safe ziplock bag and freeze until ready to bake). Otherwise, bake in the preheated oven for 30-35 minutes or until golden brown. Melt the butter in a saucepan over medium-low heat. Whisk together cornstarch and 1/4 cup broth. Whisk mixture into butter and cook until thickened, whisking often. Slowly stir in broth and burgundy. Increase heat to medium high. Bring the mixture to a boil, then reduce heat and simmer for 10-15 minutes or until mixture is thick enough to coat the back of a spoon. Stir in rosemary. Taste. Add salt, if needed. Note: You will likely have filling leftover. You can saute this and eat it plain (it's delicious!) or throw it into a stew or breakfast scramble. Compensation was provided by Gallo Family Vineyards via Sunday Supper, LLC. As always, the opinions expressed herein are my own, and are not indicative of the opinions or positions of Gallo Family Vineyards. Check out all the other delicious recipes made with Gallo’s Hearty Burgundy! Don’t forget to join us for the #SundaySupper twitter chat featuring Gallo Family Vineyards at Sunday at 7 PM EST. If you love food and wine, you’ll want to be a part of this one! I haven’t had a pasty in years, well, many years. Seeing this makes me want some very soon. Love that sauce! I’m a new pasty fan! These look wonderful…and I never thought about packing one in a lunch box. That would sure make someone’s day! They’re made for lunch Marjory! You definitely need to give them a try…so good! Love this! I’ve never known these as pasties but this back story and history is awesome! give me anything in a flaky crust and I’m there! These Cornish Pasties look delicious and love that inside shot!! Delicious! Here’s to Hearty Burgundy! Thanks Alice! Yeah, I had no idea either until I met my husband. It’s a very cool story and they’re so delicious! 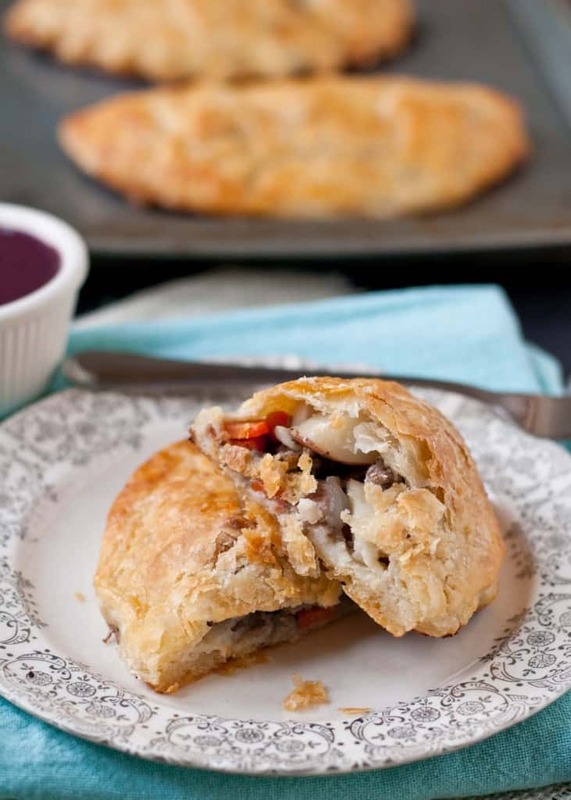 Now this is a pasty I can love 😉 They look amazing…and can’t wait to make some for my family!!!! Hehe…you should have seen my google search results when I just put in “pasties” on Friday. WHEW! Not what I had in mind. These look fabulous! I can just imagine that first bite of deliciousness! Love that these can be made ahead of time and served for a special event. Definitely. I have a couple in the freezer right now just waiting for a busy weeknight. Meat pies go over big around here. Can’t wait to try yours! Here too! 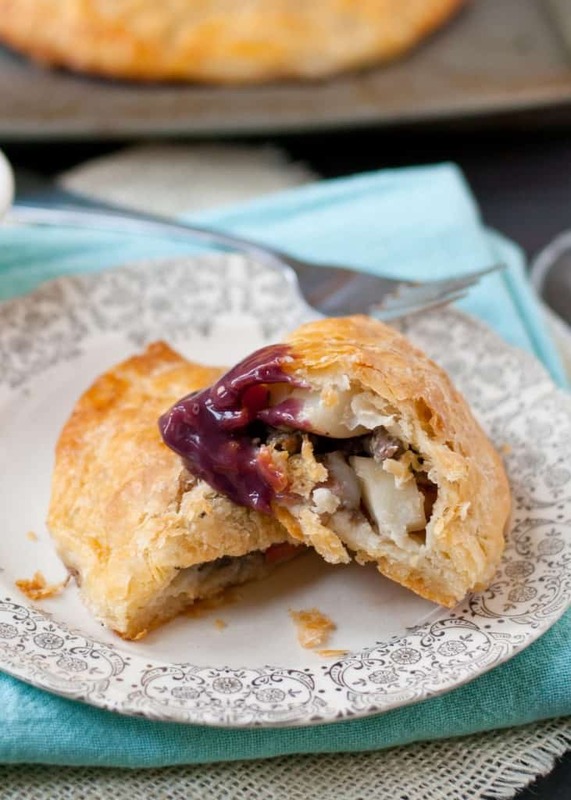 It’s hard to resist a beef filling with flaky pastry! Give me a straw and pass that gravy! I’ll take anything stuffed inside buttery crust. These look amazing. Ohhhhhhhhh, this looks so darn good!! It just screams my name! Just perfect!! I color of that sauce is amazing! Also you need to come visit me, so I can take you to my favorite place to get New Zealand meat pies! Essentially the same thing as pastys but they do everything from breakfast pie to mince and cheese to chicken, etc. . .So yes. Come visit. Oh yes. I want that in my life. Breakfast pie?? Heck yeah. Anything that is portable in dough sounds like perfection to me. Yum!!! Oh look at that beautiful purple gravy! These are hand pies are simply adorable. Isn’t it crazy? It sort of weirded me out at first but I ended up loving the way it looked. Oh, my goodness, Courtney. I’d love one for each hand…And you’re right. Your delectable goodies would be perfect for a casual lunch or an elegant dinner party served with Burgundy wine! Once again I learned about a new dish from Sunday Supper! Thanks for sharing! Oh my gosh, HECK YES! Being a Michigander, I may be a bit biased, but these are so awesome. And the color of that gravy. Wowza. The color was so funky when I was making it, but I ended up loving the way it turned out. The pasty thing is one thing Michigan has definitely gotten right! What a creative use of the Hearty Burgundy. I LOVE this!